Mazda's flagship sedan is back and better than ever this model year with a fresh cabin, small exterior updates and a responsive powertrain that has proven its success over the years. Already featured as one of "Ward's 10 Best Interiors" by Wards Auto World magazine, the 2016 Mazda6 sedan in Houston is a superlative choice that combines efficiency, comfort, safety and functionality into a stylish package that is sure to exceed all expectations. Want to learn more? Check out our full 2016 Mazda6 review below! Mazda got it right this year. Between the Sport, Touring and Grand Touring trims, the Mazda6 showcases the perfect blend of upscale details and realistic features for a well-rounded sedan that competes in the midsize segment with plenty of vigor. Wrapped in a sleek exterior that showcases smooth dimensions and plenty of amenities, this car stands out as a well-rounded choice meant for the active Texas buyer. 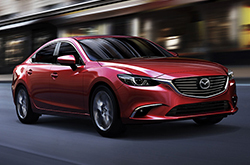 Standard with a SKYACTIV® TECHNOLOGY 2.5-L four-cylinder that offers an impressive 184 horsepower and 185 lb.-ft. of torque, the Mazda6 is a capable carrier that can deliver you from point A to point B without any hassles. Add in the excellent fuel economy ratings and the option of a six-speed manual or paddle-shift automatic transmission and it is easy to see why this sedan receives plenty of accolades for its under-the-hood capabilities. Of course, the powertrain isn't the only outstanding aspect of this year's model. When checking out the 2016 Mazda6 in Houston, you'll surely notice the award-winning interior that rivals luxury style. The all-new 7-inch touch screen display serves as a responsive interface for infotainment needs while the base Bluetooth system, remote keyless entry, Commander control dial and hands-free texting software allow for a truly next-generation experience with this-generation accessibility. If you're looking for a near-luxury experience, our 2016 Mazda6 review suggests the Grand Touring model that is updated this year with enhanced LED lights along with a power moonroof, heated leather front seats, an 11-speak Bose audio system, a navigation system with real time traffic updates and an auto-dimming rearview mirror. What are you waiting for? Stop on by our location at 16484 Northwest Freeway in Houston today to experience this well-rounded sedan for yourself! 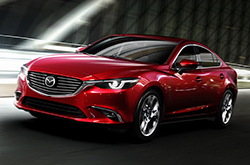 Compare Mazda's newest model of the Mazda6 to its rivals and we're confident that you'll choose it over vehicles like the 2016 Toyota Camry, Honda Accord, Ford Fusion and the Nissan Altima. If the Mazda6's state-of-the-art features and exquisite looks don't prove to you that it's the ideal vehicle for you, we're sure its cut-rate cost will. For Houston Mazda customers who want a truly outstanding value, just compare this vehicle's price to the forementioned vehicle options and you'll see that it's a worthy investment. Find even more useful facts; see our quick-facts list for the Mazda6 - bullets underneath this text. Thank you for reading our complete 2016 Mazda6 review, written by Joe Myers Mazda's automotive authors. Because it's time consuming to get reviews with up-to-date? specs on dealer sites, we've made it our mission to provide reviews from well-informed writers. The above article is overloaded with usable material - it contains info about mpg and other specs so that you can make smart decisions about the Mazda you want to buy. Please visit our Mazda review and compare gallery if you feel the Mazda6 is not made for you; there you&ll learn about Joe Myers Mazda's entire lineup.